Every traveler has a travel bucket list. The more one travels destinations, attractions, and experiences are crossed off the list, but what’s funny is that more appear. After having traveled extensively through Europe, Central and South America, and the Caribbean, I have seen some good dives. It all started when I got certified in a lake in October in Wisconsin over 15 years ago. Then, my first dive was in Cozumel. Not a bad place, huh? Then, I continued to the Pacific Coast of Mexico, the Florida Keys, in and around the wrecks off of Fort Lauderdale, and of course the Bahamas. However, I still have the South Pacific on my list. Having heard raving reviews, I wanted to allow another writer and expert, Katie Green, to give you some tips on scuba diving in Bali. Take it away Katie! Although scuba diving is a popular vacation activity in many areas worldwide, there is probably no better place to enjoy it than the Indonesian island of Bali. Located near the western edge of the Pacific Rim, Bali has long been noted for a marine habitat extraordinarily rich in bio-diversity – which is a fancy way of saying that Bali is a place where divers can see an amazing number of fish species. In fact, Indonesia is host to about 25% of all the fish species found worldwide. This makes it nothing less than a diver’s paradise. One of the most important things to understand in advance about Bali is that tropical sunlight is much more intense than visitors expect. Bali is located quite near the equator; tourists from cooler climates who have not traveled to Indonesia before will have little idea what to expect. It’s therefore essential that those coming for a dive vacation plan ahead and bring items such as sun hats, sunglasses, and plenty of strong sunblock. Many dive sites in Bali provide discounts to those who arrive prepared with all their own gear. Of course, packing and transporting scuba gear can be a hassle, but the cost savings make it worthwhile for some enthusiasts. Other important items for certified divers to bring along are their logbook and official certification card. These can demonstrate a diver’s qualifications to explore more difficult sites or skip a mandatory session of basic dive instruction. Visitors who come to Bali for the scuba diving opportunities should keep in mind that there will be a visa entry fee of $25, and that to enter the country a tourist’s passport must have an expiration date at least six months in the future. Before making the trip, visitors should be vaccinated for a range of tropical diseases, including malaria. With these preparations all made, tourists are well prepared to enjoy themselves to the fullest while diving off the shores of Bali. Beginners may wish to start with Benoa, which is situated near the southern tip of the island – quite near the Kuta villas resort area. 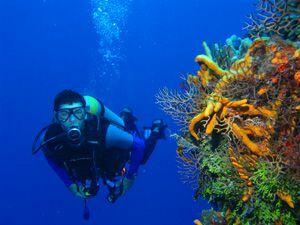 This dive site is considered ideal for novices because it possesses twin advantages: relatively calm currents, along with the opportunity to explore the fringe reefs which trace the coast near Nusa Dua and Serandan Island. Menjangan Island offers a more challenging dive environment and is considered appropriate for those with some experience. There are several coral reefs in this area, which feature species such as angelfish, butterfly fish, and several varieties of sharks. Divers need not be experts to explore the underwater terrain there, as the diving at Menjangan Peti, for example, is not terribly deep. Nusa Penida, on the other hand, is best reserved for expert divers because of its unpredictable currents. For those with sufficient experience and a taste for adventure Nusa Penida can be ideal. The sea there fairly teems with life; Nusa Penida is especially well known for large sea creatures including manta rays, eagle rays, turtles, and the giant ocean sunfish, locally referred to as the Mola Mola. It is often said that there is ‘nothing new under the sun,’ but when that sun hovers over the warm, tropical island of Bali, there is something for everyone: a dive adventure perfectly suited to every ability level. ***Sponsored post written by Katie Green, a freelance writer who loves travelling and meeting new people. She is currently interested in travelling to Asian countries and planning to visit some of them next year. I’ve never SCUBA dived, but it’s something I’d love to do at some point. Bali looks like a wonderful place to do it!